iv) greater association of CP with NDF. Unlike most cool-season grasses and legumes produced in Wisconsin, concentrations of neutral detergent insoluble CP (NDICP) often account for more than 50% of the CP within the forage. iii) it is routinely sorted by dairy cows and replacement heifers, which complicates its use in production situations where there is inadequate bunk space for all animals to eat simultaneously. Therefore, an alternative to straw, particularly one that is non-sortable by heifers or cows, would be a desirable addition to a ‘toolbox’ of forage options for Wisconsin dairy producers. Compared to annuals, perennial forages also offer cost and time savings by eliminating annual establishment costs. Recent work at the Marshfield Agricultural Research Station has demonstrated that EGG is a perennial, high-fiber, low-energy forage that is not sorted by replacement dairy heifers (Coblentz et al., 2012). This Focus on Forage summarizes agronomic research efforts conducted in Marshfield that evaluated EGG as a potential alternative to straw in diets of dairy cattle. 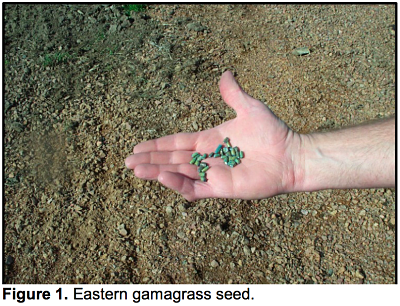 How is Eastern Gamagrass Established? A second option is to place EGG seeds in cold storage for 6 to 10 weeks prior to planting; normally, seeds are moistened prior to cold chilling, and this process also may contain additional additives to further aid in breaking seed dormancy. Pre-chilled seed can be purchased from some vendors, but it must remain refrigerated until planting. Finally, the Gamagrass Seed Co. (Falls City, NE) offers a Germtec ll™ seed treatment that eliminated the need for refrigeration until planting. We have found this last option to be very effective, and the added convenience may justify the additional cots. It is important to note that EGG seed will revert into dormancy if field conditions are not suitable to support germination; it is not uncommon to observe EGG plants germinating a full year or more after planting, especially if drought occurs during the establishment year. Normal recommendations for planting depth are 1 to 11⁄2 inches, but this standard should be adjusted as necessary to ensure that seeds are placed where there is adequate moisture for germination. Premature drying of the soil following planting will encourage EGG seeds to revert into dormancy. Although EGG is easily planted with most row-type (corn or soybean) planters, it also can be planted with a drill. The choice of planter can be related somewhat to the growth habit of EGG, and to the needs of the individual producer. Without crowding from other plants, EGG crowns can grow as large as 4 feet in diameter, and may be elevated 6 inches above the soil surface; obviously, this may create problems with respect to equipment traffic that include roughness or excessive vibration to hay or silage equipment, and also physical damage to the crowns of the EGG plants. Several theories exist to combat this problem. One approach is to plant EGG with row spacings that allow harvesting equipment to straddle the large crowns, thereby reducing vibration (Figure 4). This also limits the size of the crowns, and allows for field cultivation to control weeds, especially during the establishment year. An alternate approach is to plant EGG with very narrow rows (probably with a drill), and allow the crowns to grow together, thereby establishing a more consistent surface for equipment traffic. 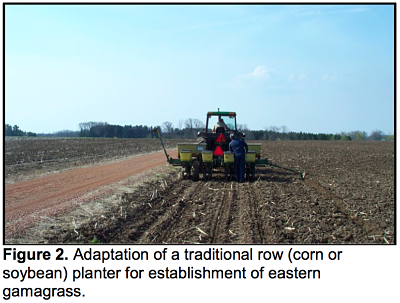 All our work at Marshfield has been conducted with EGG planted in 30-inch rows using a planter with finger pick- up meters (why red in PDF article? ); therefore, direct comparisons of these techniques are not available for Wisconsin conditions. What Yields Can Be Expected? 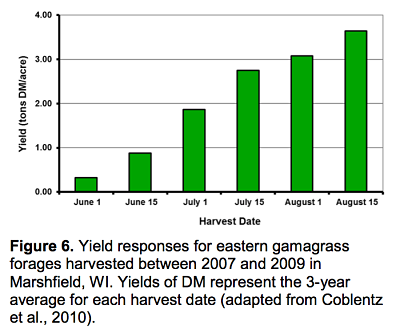 Initial trials evaluating DM yield were conducted at the Marshfield Agricultural Research Station from 2007 to 2009. Plots were established in 2006, and then harvested once per year on June 1st, June 15th, July 1st, July 15th, August 1st, or August 15th (Figure 5). Typically, EGG begins growing earlier in the spring than other tall-growing, perennial warm-season grasses, such as switchgrass, big bluestem, or indiangrass, but these characteristics have seldom been evaluated as far north as central Wisconsin. Our results (Figure 6; adapted from Coblentz et al., 2010) suggest that the relatively cold climate suppressed early-season growth, resulting in a 3-year average yield of only 0.32 tons DM/acre by June 1st. Yields increased after June 1st in a mostly linear relationship with harvest date, reaching a maximum of 3.64 tons DM/acre (3-year average) by August 15th. During the most favorable growing year (2008), yields reached 4.35 tons DM/acre on that date. Throughout the study, there was no indication yields were actually maximized by August 15th, which suggests that growth was limited by inadequate accumulation of growing degree days, and that delaying harvest dates beyond August 15th may further increase yields. However, most extension recommendations for fall harvest management of EGG include some cautions about allowing adequate recovery time before first-frost for regeneration of growth reserves. These recommendations have ranged from ‘do not harvest after September 10th in Missouri (Roberts and Kallenbach, 1999) to allowing 45 days prior to first-frost in Oklahoma (Gillen, 2001). Because single-harvest yields did not appear to be maximized in central Wisconsin by August 15th, we subsequently conducted a second yield trial at Marshfield from 2010 to 2013. The second trial was conducted in much the same way as the first, except that harvest dates began on August 1st, and continued at 15-day intervals through November 1st. All plots were fertilized with 75 lbs N/acre applied as urea (46-0-0) in late-May. We did not detect problems with persistence as a result of applying these treatments, and yield responses are summarized in Figure 7. From these data, it appears that DM yield is likely to be maximized sometime during late-September; 4-year average yield responses on September 15th and October 1st were comparable (3.32 and 3.31 tons DM/acre, respectively). Although we observed no problems with stand persistence as a result of applying these treatments, it is advisable to maintain high levels of potassium fertility, and to strictly observe an elevated cutting height (6 to 8 inches above the crown). These recommendations for EGG are appropriate, regardless of harvest date, but are especially important when using a one-time, early-fall harvest system. 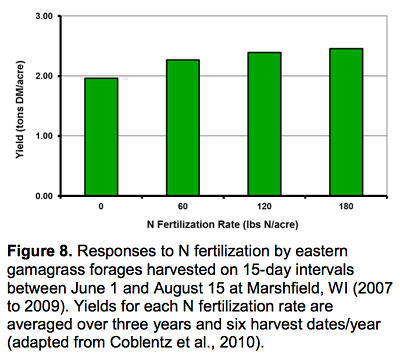 What Are Appropriate Nitrogen Fertilization Rates? at rates ranging from 50 to 100 lbs N/acre, but less-efficient returns are likely at greater N application rate. 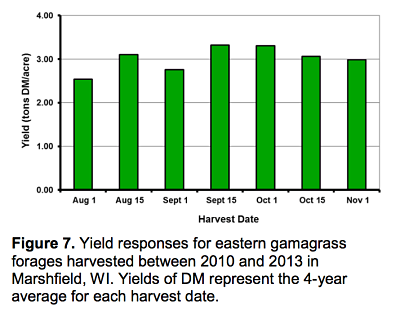 Can Eastern Gamagrass Be Ensiled? Generally, ensiling EGG appears to be viable. Turner (1997) found that silage fermentation was improved by application of an inoculant supplying lactic-acid producing bacteria to the silage mass, or by fortification with additional fermentable carbohydrate (molasses). When applied in combination, the effects of these treatments were largely additive. Based on that work, application of a good commercial inoculant supplying lactic-acid producing bacteria during ensiling is a solid recommendation. From a management standpoint, another logical question would be whether EGG forages can be direct-cut, or mowed/conditioned and then ensiled without wilting. For several reasons, it appears that this can be accomplished quite easily. 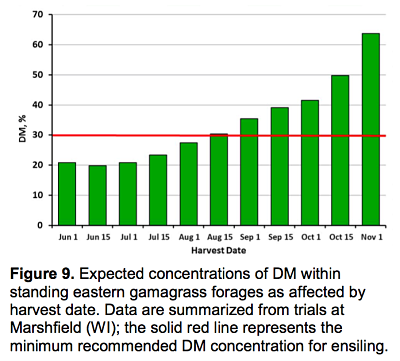 First, a summary of work at Marshfield (Figure 9) suggests that the DM concentration within EGG increases with maturation throughout the summer and fall, and likely will exceed the standard recommendation of 30% for acceptable silage fermentation any time after September 1st. Furthermore, standing perennial warm-season grasses are known to exhibit wide fluctuations in water content throughout the day, often becoming considerably drier in mid-afternoon compared to early morning. Another characteristic of perennial warm-season grasses is a rapid drying rate after mowing, and EGG appears to consistently exhibit this trait. The greatest practical silage-related problem observed at Marshfield has been a tendency for fermented EGG silages to respire and heat spontaneously after extended exposure to air during hot weather. This may be related to the bulky nature of the grass after chopping that allows avenues for air access into the exposed silage face, but is more likely associated with slow feed-out rates when EGG silages are used only as a substitute for chopped straw in dairy or dairy-heifer diets. It is important to consider the likely feed-out rate within any operation, and then size the silo or exposed silage face accordingly in order to limit prolonged exposure to air prior to feeding, especially during summer months. Are There Other Management Considerations? 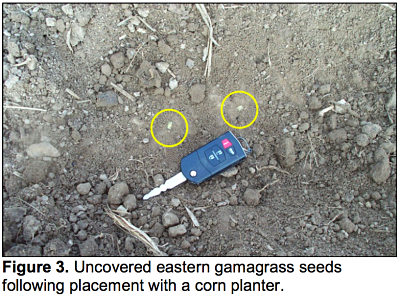 Consistent with many other perennial warm-season grasses, EGG grows slowly after seeding; producers should not expect to harvest any forage during the establishment year. Eastern gamagrass is very sensitive to repeated defoliation, especially with short rest intervals, and it is essential that sufficient residue remain following defoliation. Most recommendations suggest allowing at least five weeks between grazing or harvest events. Regardless of harvest/utilization strategy, 6 to 8 inches of growth should be retained above the surface of the crown (not the ground) following any mechanical harvest or grazing event. Depending on the height of the crown, this means the appropriate cutting or grazing height may be 10 to 12 inches above the soil surface. Historically, EGG has been viewed as an ‘ice-cream-cone grass’ that is very palatable to livestock, and often has been grazed preferentially in fenced pastures. Because of these known sensitivities to repeated and/or close grazing, EGG is seldom found in fenced native pastures throughout the lower Midwest. The traits described above make EGG a poor choice for continuous, unmanaged grazing. Any attempt to utilize EGG in grazing operations should be carefully managed with respect to rest intervals between grazing events, as well as residue height following each grazing event. Although the focus of research at Marshfield has been using EGG to replace chopped straw in the diets of dairy heifers and cows, EGG can be managed in a multiple-harvest system in order to improve or maintain forage quality. Because of the relatively short growing season in Wisconsin, this approach appears less viable than in the lower Midwest. Our results in Marshfield suggest that significant reductions in annual yield are likely in Wisconsin with multiple-cut harvest systems. In addition, other intermediate-quality forages are obtained easily in Wisconsin; therefore, the overall utility of a multiple-harvest approach appears limited. 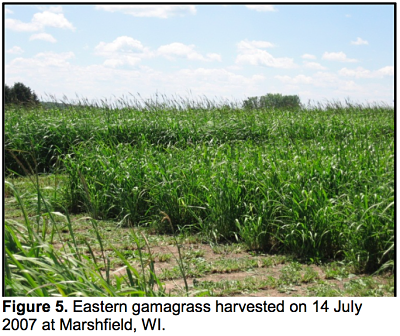 Eastern gamagrass is tolerant of occasional flooding, but because of its warm-season physiology, it remains unclear how well it might compete with reed carnarygrass on wet soils in Wisconsin. Overall, using EGG in Wisconsin appears viable. A research stand established in Marshfield in 2006 continues to flourish, and shows no signs of sensitivity to the colder climate. However, a couple of cautions remain. First, research efforts remain exploratory; any producer interested in utilizing EGG should proceed cautiously. The most obvious concern about production of EGG relates to weed control, especially during the establishment year. Herbicide options are limited for establishment of native warm-season perennial grasses. Some older extension publications have suggested establishing EGG following several years of corn in which atrazine has been applied at maximum rates, thereby relying on carry-over effects of the herbicide to provide initial weed control (Roberts and Kallenbach, 1999). Once established, EGG competes well with most weeds, and use of a row-type planter allows for cultivation as a method of weed control. Throughout the lower Midwest, the residue from the previous growing season often is removed by prescribed burning (Figure 10) when tiller bases exhibit about 1 inch of new growth each spring (early-to-mid May). This approach improves spring weed control, but may not be permissible throughout much of Wisconsin. Another management concern relates to heavy equipment traffic across stands of EGG. As previously mentioned, the crowns of EGG plants can become quite large, and may reach heights approaching 6 inches above the soil surface. The most common ways to utilize this forage throughout the lower Midwest are by managed grazing or haying. Neither of these management options has exhibited great damage to stands, but it can’t be assumed that this is true for (heavier) silage harvesting equipment, which has more potential for damage, and is the most likely method of harvest/utilization throughout Wisconsin. Bates, L.S., M. Bender, and W. Jackson. 1981. Eastern gamagrass. Seed structure and protein quality. Cereal Chem. 58:138-141. Coblentz, W.K., P.C. Hoffman, N.M. Esser, and M.G. Bertram. 2012. Using eastern gamagrass to construct diets that limit intake and caloric density for dairy replacement heifers. J. Dairy Sci. 95:6057-6071. Coblentz, W.K., W.E. Jokela, P.C. Hoffman, and M.G. Bertram. 2010. 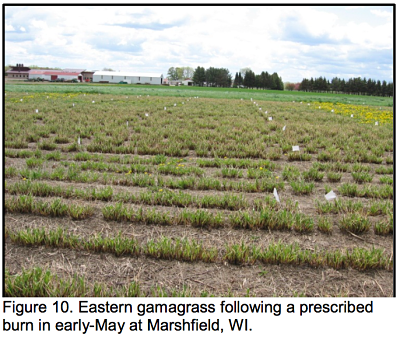 Unique dairy applications for eastern gamagrass in central Wisconsin: I. Yield potential. Agron. J. 102:1710-1719. Gillen, R.L. 2001. 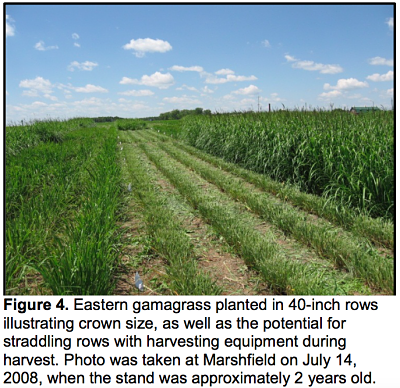 Production and grazing management for eastern gamagrass. Proceedings of the 56th Southern Pasture and Forage Crop Improvement Conference. April 21-22, 2001. Springdale, AR. Roberts, C.A., and R. Kallenbach. 1999. Eastern gamagrass. Publication #G4671. University of Missouri Extension, Columbia, MO. Stubbendieck, J., S.L. Hatch, and K.J. Kjar. 1982. North American Range Plants. 2nd Ed. Univ. Nebraska Press, Lincoln. Turner, J.E. 1997. The effects of stage of maturity, method of preservation, and silage additives on the fermentation and nutritive value of smooth bromegrass and eastern gamagrass. M.S. Thesis. Department of Animal Sciences and Industry. Kansas State University, Manhattan. Mention of trade names or commercial products in this article are solely for the purpose of providing specific information, and do not imply either recommendation or endorsement by the U.S. Department of Agriculture.